I received The Pie and Pastry Bible as a gift at Christmas, and I absolutely love it. It reminds me a lot of Bo Friberg's The Professional Pastry Chef - both books cover the basics of nearly every technique or recipe, and then explore the myriad fun variations of each. The recipe for this apricot and honey chiffon pie came from the book, and it's a good recipe, but the best part is the frivolous, fanciful effect of the "honeycomb" on top. The secret is after the jump. You can do this technique with any chiffon pie (maybe substitute honey and apricot preserves - pureed in a food processor - for the lemon juice in this recipe), or even one of those Jello-O no-bake pie recipes. Just press clean, new bubble-wrap onto the surface of the pie when it's still soft, and freeze it solid. Microwave a half-cup of apricot preserves for two minutes, or until it starts to bubble, and then strain out the solids. Let the apricot glaze cool completely, remove the bubble wrap, and then brush or pour the glaze onto the still-frozen pie. For the bees, make a basic chocolate ganache, and use a small round pastry tip to pipe one-inch-long bee shapes onto waxed paper. Freeze them, then melt a little white chocolate and use a small round tip to pipe stripes and adhere almond "wings." This go-round was a little messy, as I was getting the hang of the process, but I can't wait to pull this technique out for Mother's Day lunches and springtime wedding showers. Mostly, though, this post gives me the opportunity to mention this clip. 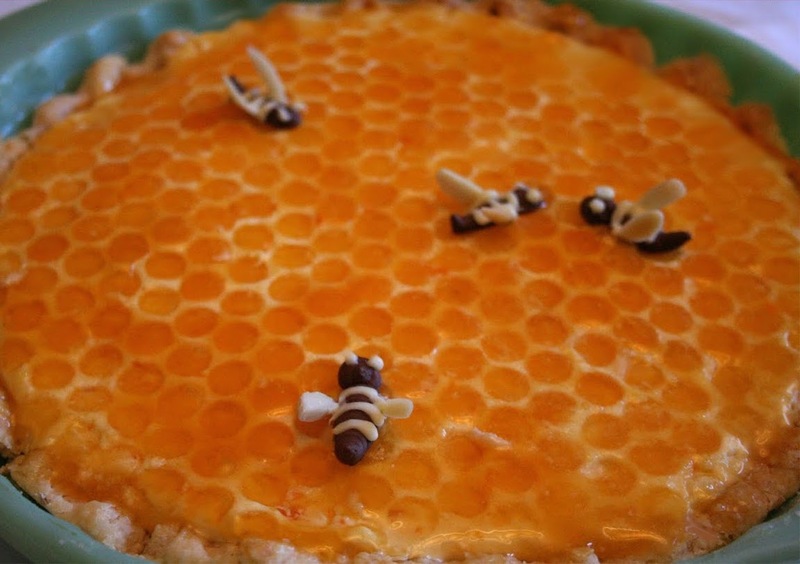 A pie full of bees! Beautiful, fun and whimsical. By the way, are those fertility bees? This is simply amazing. I have completely fall in love with this! This is utterly wonderful! I am going to make it at the next available opportunity! 3 pounds of REAL bees only costs $70 Liz. That will probably last you a couple thousand of these pies. What a deal, Tim! I would like to have a couple of pounds on hand. Also, I think we should include Arrested Development clips in every post. Next up, a recipe for frozen bananas! BEADS. There's nothing I love more than AD-themed baking. Huzzah! How Fun. Imagine bringing that to a party! Can't wait to try.